On the 30th of November 2018 we are adding another milestone to our Enkronos Apps development – Feelgrid. The platform allows the gathering of data in time and space enabling thus their scientific analysis. The results of analysis translates directly into a benefit for end users, which in vineyards case can be wine growers as much as winemakers and enologists. An example of application is given by the measures required for the management of vineyards, which we are using in area of Goriška Brda (Slovenija). Readings of temperature and humidity in the air and ground or values of leaf wetness, sunlight, rain and other data can help to better manage the production process of winegrowing. 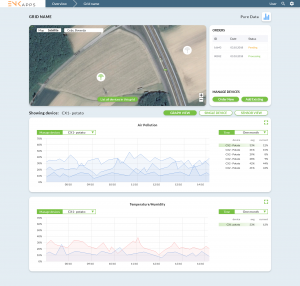 How to, for example, optimize treatments and irrigation only on the basis of the actual need of plants, monitored in real time, remotely and comfortably visible from a PC or smartphone. Another great use case of Feelgrid is “Complex data measurment” that was made for a Corus Engineers, a civil engineers company from Slovenia. Check it out here!